The Accidental Locavore always wonders what to do with cabbage when it’s hot out. Earlier this summer one of the guys at the farm said he roasts his (which wasn’t really a solution to the cabbage in August dilemma); I’ve been thinking about roasting or grilling it. I came across a series of recipes for grilling cabbage on Serious Eats recently and gave it a try the other night at a friend’s house (larger audience of guinea pigs). I used a medium sized cabbage and this fed 6 as a side dish. Combine 2 tablespoons of the lime juice, fish sauce, sugar and garlic in a small microwaveable bowl (I used a glass measuring cup). Microwave until steaming hot, about 20-30 seconds. Add red pepper flakes. Stir until the sugar is dissolved. Cool in the refrigerator. When it’s cooled, add the mint, cilantro and remaining lime juice. Taste and add additional red pepper flakes and fish sauce if you’d like. Preheat a gas or charcoal grill to high. 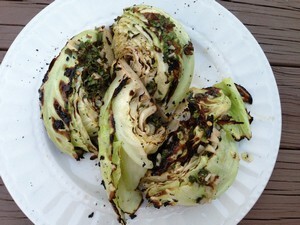 Place the cabbage wedges directly on the grill and grill, covered, for about 3 minutes a side, for all three sides. Either lower the heat, or move the cabbage to a cooler spot on the grill and cook until the cabbage is tender, about another 4-5 minutes. In a large bowl, put the olive oil, salt and pepper. Add the cooked cabbage and gently toss to coat. Drizzle the sauce over it, serve and enjoy! My verdict: The sauce was great and would work well with broccoli, Brussels sprouts or even cauliflower. The guinea pigs all enjoyed it (or said they did). I kept it pretty mild as we were dining with friends and I wasn’t sure what their heat tolerance was. The issue was the cabbage. It got nicely browned on the grill, but got tossed off the grill to make room for other stuff and didn’t get the extra 5 minutes of cooking time, so it was pretty crunchy. Near the core, it was raw, so really tough and essentially inedible. A quick couple of minutes in the microwave before grilling would have helped, or more grill time. If you don’t have a grill, you could easily do this on a grill pan. 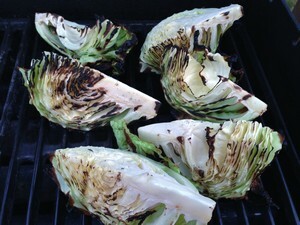 If you use a grill pan, I would pre-cook the cabbage, unless you have a cover for the grill pan. I’m definitely going to try doing another cabbage this way, but will cook it until it’s tender.